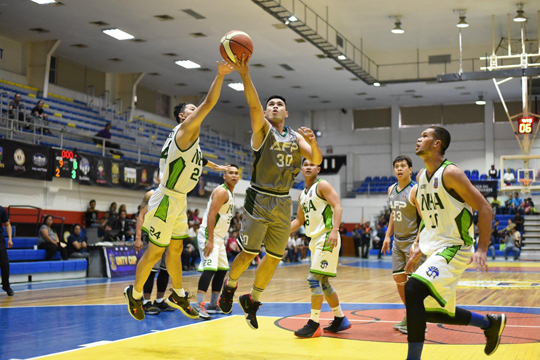 Two-time champion Armed Forces of the Philippines drew a stellar showing from Darwin Cordero and downed National Housing Authority, 86-78, to advance to the finals of the 7th UNTV Cup held over the weekend at the Pasig City Sports Center. Alvin Vitug helped NHA beat defending champion Senate, 89-82 in overtime by scoring 19 points. In his most explosive game so far, Cordero scattered eight of his game-high 30 points in the payoff period as the AFP Cavaliers completed a two-game sweep of their best-of-three semis series in the event organized by UNTV president and CEO Dr. Daniel Razon for public servants. Willy Casulla added 17 points and three boards, while former national team members Eugene Tan and Boyet Bautista chipped in 10 points each for AFP, which is bidding to become the first three-time champion of the annual tournament. In the finals, the Cavaliers will face either the reigning champions Senate Defenders or the PNP Responders. The Mike Fermin-mentored Defenders forced a rubber match in their own semis series with a narrow 74-69 win over the Responders—a feat that ended the latter’s seven-game winning streak dating back to the first stage of the elims. The chosen charity of the champion team gets a tax-free P4 million prize while the foundation selected by the runner-up squad receives P2 million. The deciding Game 3 will be held on Feb. 24. In beating the Responders, the Defenders used an air-tight defense to throw the usually high-scoring Ollan Omiping out of his comfort zone. The former University of the East player—a teammate of Rain or Shine’s James Yap and San Miguel’s Ronald Tubid—was held to just 12 points this time—a far cry from his 27-point show in the team’s 79-74 win in Game 1. James Ryan Mangaran led Senate with 17 points while Rey Malaga, Jr. contributed six of his 12 points in the fourth that helped change the complexion of the game.